Home / News / Features / Discover T1X / Business Profile – Sign Concepts Ltd.
Business Profile – Sign Concepts Ltd.
All you need is a sign, and Sign Concepts Ltd. can help you with that. For any business, your sign is often one of the first ways you communicate with your prospective customer. Of course, you want that communication to be clear and effective. 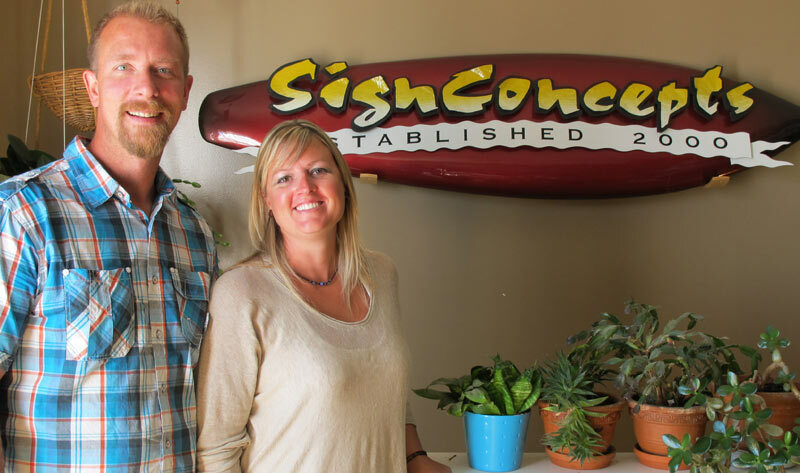 Scott Piro and Meghan Tudor, owners of Sign Concepts, have the knowledge and experience to make sure your business is using all the right signs. They pride themselves on exceptional customer service and customer satisfaction, knowing the importance of exceeding the client’s expectations. Sign Concepts Ltd. produce custom made commercial signage. The list of applications they provide when it comes to signage is incredible, they are a full service sign company, meaning they can design, fabricate and install any type of application that you are looking for. Exterior Signs are vital to the success of any business, especially small business as it is the most effective, yet least expensive form of advertising. Your sign will draw attention to your business 24 hours a day, 365 days a year. Because people often judge a business by how the sign looks, it is important to not only know what works best for your situation but to also make sure it is eye catching and effective. Sign Concepts has been in business since 2000, so they are knowledgeable about these important factors and can help you to determine what’s best. Not only can they make the popular L.E.D. Channel Letters for store fronts but they can also do window lettering, back lit/translucent signage and dimensional lettering. Store front signs announce your presence and studies show that with the right sign, you can attract new customers and increase business. We live in a mobile society, so vehicle graphics and lettering are an excellent way to grab people’s attentions while you are on the go. According to industry statistics, the average delivery truck makes 16 million visual impressions in a single year. Sign Concepts can turn your vehicle or trailer into a unique, moving billboard that can reach a wider demographic not possible with stationary signs. Election signs anyone? With municipal elections just around the corner, perhaps you are looking for a portable option, in which case you need to contact Sign Concepts. Movable sign such as a banner, sandwich board or coroplast placed in a prominent location can draw attention to yourself / business. They are a convenient way of letting passersby’s know that you exist; as well as help potential customers locate your business in a crowded shopping area. An attractive sign can elicit an impromptu decision use your business and makes you stand out from your competition. Banners have great versatility and can be displayed indoors or out. Sandwich boards are available in a variety of sizes and materials and are a perfect portable advertising and marketing tool. Coroplast is a corrugated plastic sheet and comes in many colors, is easily produced works well as lawn stake advertising, tournament signs, builder advertising and temporary directional signs. So for all you political hopefuls out there – now you know who to call to get your campaign signs. Need custom signs? That’s no problem for Sign Concepts. They offer customized solutions to any project you have. Whether it’s etched glass vinyl, custom banner stands for your tradeshow or office, way-finder signs to “point the way”, or original installations for your workplace or site development, Sign Concepts can do it for you. The business was started in Airdrie in 2000; and moved to Langdon about a year ago. Because the business is growing, they are looking forward to relocating to a larger space within Chestermere in early 2014. This innovative company serves Airdrie, Chestermere, Langdon, Strathmore, Calgary and Surrounding Areas. They have a total of 3 employees including themselves, and are currently looking to hire a new sign production and installation assistant. The couple has lived in Langdon for over 10 years and growing up in Dalemead, Meghan is very connected within the community. The owners are a part of the Chestermere Chamber of Commerce and Meghan is the founder of the Chestermere Area Networking Club (CAN). CAN is a profession exclusive club that meets bi-weekly to discuss business and share ideas to grow business in Chestermere. For more information, you can email info@chestermereareanetworking.com. Contact Sign Concepts Ltd. at (403)936-8595 or visit their website at www.signconceptsltd.com for a quote or to receive more information on how they can help you to grow your business with the perfect sign.